Eudokia Megale Komnene (died after 4 September 1395), was a Trapezuntine noblewoman, and a member of the powerful Byzantine Komnenos dynasty as a daughter of Emperor Alexios III of Trebizond. She was styled Despoina in Sinop after her first marriage to Muslim Turkmen Tadjeddin Pasha of Sinop, Emir of Limnia, which had been arranged by her father to foster peaceful relations between the Pontic Greek Christians and the neighbouring Muslims. Eudokia was born on an unknown date, the second daughter of Emperor Alexios III and Theodora Kantakouzene. She had two brothers, and three sisters; the eldest Anna later became Queen consort of Georgia as the second wife of King Bagrat V.
The Chronicle of Michael Panaretos records the marriage on "8 October 1378 at Oinaion of Eudokia and Muslim Turkmen ruler Tadjeddin Pasha of Sinop, Emir of Limnia" after which "the Emperor took over Limnia". Her sisters, Maria and another whose name has not come down to us also married Muslims, but "in this case the bridegroom ... was by far the best." According to Elizabeth Zachariadou, Tadjeddin was not prince of Limnia, but of Niksar, where the tomb of Melik Danishmend is located, and whose territory comprised the fertile plain of Phanaroia, and important fortresses such as Iskefser and Sonusa. Tadjeddin had sent an envoy to Alexios, who met with the Emperor June 1362 to discuss a marriage, but popular sentiment was against a possible marriage at the time. Such an arrangement was not unprecedented. Prior to Eudokia's wedding, at least two of Alexios' sisters had been married to neighboring Muslim rulers: Maria had been married to Fahreddin Kutlug beg, Emir of Aq Qoyunlu in 1352, while Theodora became the wife of Hajji 'Umar, Emir of Chalybia in 1358. Anthony Bryer discussed the diplomatic strategy of marriages like this—for which the later Empire of Trebizond was famous—in his 1975 paper. He documented no fewer than 11 marriages between princesses of the Grand Komnenoi and their Turkmen neighbors, while only five princesses were married to Christian rulers. 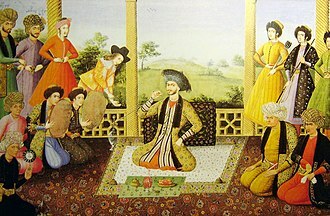 Tension existed in these relationships not only due to difference over religions, but to marriage customs. "It would be especially interesting to know why popular opinion made Alexios III refuse Tadeddin's first request for a bride in 1362," writes Bryer, then discusses possible political reasons for the extended parley and Eudokia's possible situation in Tadjeddin's court, before admitting that the situation "was probably left as ambiguous as Panaretos is on the subject, for, so far as Alexios III was concerned, the ends amply justified the means." Zachariadou notes that around 1362 Tadjeddin was an ally of the emir of Amasya, and both faced a dangerous foe in Eretna, the ruler of Sivas; to form an alliance with Tadjeddin at that time, observes Zachariadou, "would openly place them in the anti-Sivas front". Further, Tadjeddin was not on good terms with his neighbor Hajji 'Umar, the husband of Eudokia's aunt Theodora. But the situation changed considerably between 1362 and 1379: Eretna had been succeeded by Kadi Burhan al-Din as sultan of Sivas, and the Kadi had formed an alliance with Kılıç Arslan, an emir who had raided Trapezuntine territory several times between those two years. By the date of Eudokia's marriage, both Alexios and Tadjeddin needed each other. Following her marriage, Eudokia was styled Despoina in Sinop. Although George Sphrantzes later notes that she had several children by Tadjeddin, only the name of one son, Altamur, is known. Altamur himself had children by other women, who left descendants. Tadjeddin died in battle 24 October 1386 fighting his uncle Haji 'Umar, where he was "cut to pieces". 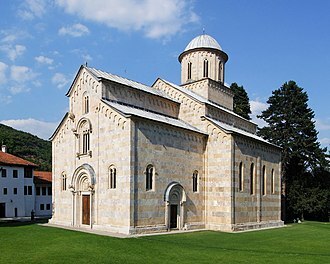 Not long after Tadjeddin died, she married Constantine Dragaš, a regional semi-independent Serbian lord. Although Laonikos Chalkokondyles states that Eudokia was the second wife of Byzantine Emperor John V Palaiologos, and William Miller repeats the historian's account of how she had been betrothed to John's son but upon meeting her the Emperor decided to marry her himself, Chalkondyles' account has been rejected by modern scholars. Eudokia's marriage to Constantine set a precedent for a Byzantine to marry a former member of a Turkish harem. Although she did not bear her second husband offspring, she had stepchildren from his first marriage, including Helena Dragaš. On 17 May 1395, she lost her second husband at the Battle of Rovine; and on 4 September of that same year, Panaretos notes that she "came from Constantinople with brides for her brother, Emperor Manuel and nephew, Lord Alexios", entering Trebizond "on Sunday, the following day in a shower of rain". After that date there is no further mention of her, but it is presumed she spent her last years in Trebizond. Isaac I Komnenos was Byzantine Emperor from 1057 to 1059, the first reigning member of the Komnenos dynasty. During his brief reign he attempted to restore the finances of the empire. Isaac was the son of Manuel Erotikos Komnenos, who served as strategos autokrator of the East under Emperor Basil II. Manuels native language was Greek, according to Steven Runciman, he was either Greek or a Hellenized Vlach and it is said that the family name was derived from the city of Komne, near Philippopolis in Thrace. 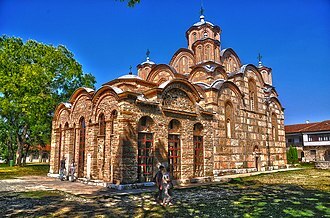 Manuel came to the notice of Basil II because of his defence, in 978, in recognition of Manuels loyalty, Basil gave him lands near Kastamuni in Paphlagonia. 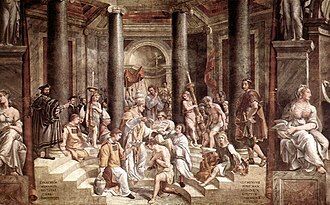 On his deathbed in 1020, Manuel commended his two surviving sons Isaac and John to the emperors care, Basil had them carefully educated at the monastery of Stoudion and afterwards advanced them to high official positions. Manuel had a daughter, born in 1012 and married around 1031 to Michael Dokeianos, Catepan of Italy, during the disturbed reigns of Basils seven immediate successors, Isaac by his prudent conduct won the confidence of the army. From 1042 to 1057, he served as commander of the army in Anatolia. In 1057, after being humiliated by the Emperor, Michael VI, he rebelled in Paphlagonia, the army proclaimed Isaac emperor on June 8,1057, and he defeated an imperial army at the Battle of Petroe. 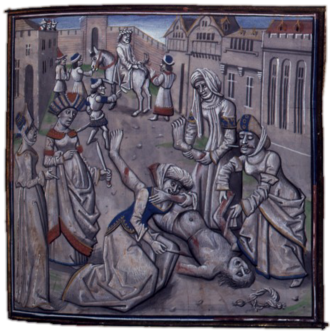 Privately Isaac showed himself more open to negotiation, and he was promised the status of co-emperor, during the course of these secret negotiations, a riot in favor of Isaac broke out in Constantinople. With the deposition of Michael VI, Patriarch Michael Keroularios crowned Isaac I emperor on September 1,1057, taking much of the credit for Isaacs acceptance as monarch. The first act of the new emperor was to reward his noble partisans with appointments that removed them from Constantinople, Isaacs only military expedition was against King Andrew I of Hungary and the Pechenegs, who began to ravage the northern frontiers in 1059. Shortly after this campaign, he concluded peace with the Kingdom of Hungary. Here he became ill, and believed he was dying. 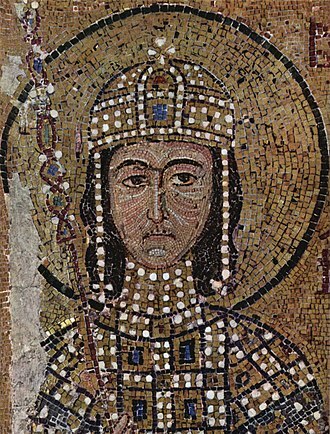 John II Komnenos or Comnenus was Byzantine Emperor from 1118 to 1143. John was a pious and dedicated monarch who was determined to undo the damage his empire had suffered following the battle of Manzikert, John has been assessed as the greatest of the Komnenian emperors. In the southeast, John extended Byzantine control from the Maeander in the west all the way to Cilicia, under John, the empires population recovered to about 10 million people. Unfortunately, Johns reign is well recorded by contemporary or near-contemporary writers than those of either his father, Alexios I, or his son. In particular little is known of the history of Johns domestic rule or policies, the Latin historian William of Tyre described John as short and unusually ugly, with eyes and complexion so dark he was known as the Moor. Yet despite his appearance, John was known as Kaloïōannēs. The epithet referred not to his body but to his character, both his parents had been unusually pious and John surpassed them. Members of his court were expected to restrict their conversation to serious subjects only, the food served at the emperors table was very frugal and John lectured courtiers who lived in excessive luxury. His speech was dignified, but he engaged in repartee on occasion, as a father he was affectionate, though he demanded high standards from his children, and he was a faithful husband to his wife. Despite his personal austerity, John had a conception of the imperial role. He was highly respected and honoured by his subjects, John was famed for his piety and his remarkably mild and just reign. He is an example of a moral ruler, at a time when cruelty was the norm. He is reputed never to have condemned anyone to death or mutilation, for this reason, he has been called the Byzantine Marcus Aurelius. 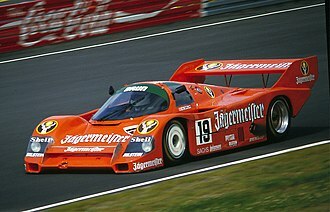 By the example of his purity and piety he effected a notable improvement in the manners of his age. John II succeeded his father as ruling basileus in 1118, but had already been proclaimed co-emperor by Alexios I on September 1,1092, Niketas Choniates alone tells of the actions by which John II secured his own accession to power. Alexios I had favoured John to succeed him over his wife Irenes favourite, the Caesar Nikephoros Bryennios, Alexios resorted to dissimulation in order to avert Irenes criticism of his choice and her demands that Nikephoros should succeed. Amasya is a city in northern Turkey and is the capital of Amasya Province, in the Black Sea Region. Amasya it is located inside the Black Sea Region, Tokat from east and Yozgat from south, Çorum from west, Samsun from north. It was the home of the geographer Strabo and the birthplace of the 15th century scholar, located in a narrow cleft of the Yesilirmak river, it has a history of 7,500 years which has left many traces still evident today. In antiquity, Amaseia was a city high on the cliffs above the river. With its Ottoman-period wooden houses and the tombs of the Pontus kings carved into the cliffs overhead, in recent years there has been a lot of investment in tourism and more foreign and Turkish tourists visit the city. During the early Ottoman rule, it was customary for young Ottoman princes to be sent to Amasya to govern, Amasya was the birthplace of the Ottoman sultans Murad I and Selim I. It is thus of importance in terms of Ottoman history. Traditional Ottoman houses near the Yeşilirmak and the main historical buildings have been restored. Behind the Ottoman wooden houses one can see the Rock Tombs of the Pontic kings, according to Strabo the Greek name Ἀμάσεια comes from Amasis, the queen of the Amazons, who were said to have lived here. The name has changed throughout history, Ἀμάσεια, Amaseia and Amasia are all found on ancient Greek and Roman coinage. Armenian, Ամասիա, Ottoman Turkish أماصيا, and modern Turkish Amasya all represent the same pronunciation, in 2012, the permanent population of the city was 91,874. The birth rate of Amasya is low, so its population has been increasing slowly, the population varies seasonally, most people are here during the summer tourist season. Despite the mountainous location, it is not far above sea level and this makes its climate more temperate. Five bridges cross the river, and most of the lies on the southern bank. The climb up to the ground is very steep, making the valley walls virtually uninhabitable. The town is shaped like the letter v as it follows a sharp bend in the river, an independent Pontic kingdom with its capital at Amaseia was established at the end of the 4th century BC in the wake of Alexanders conquests. John Komnenos was a Byzantine aristocrat and military leader. The younger brother of Emperor Isaac I Komnenos, he served as Domestic of the Schools during Isaacs brief reign, when Isaac I abdicated, Constantine X Doukas became emperor and John withdrew from public life until his death in 1067. John Komnenos was born c.1015 as the son of the patrikios Manuel Erotikos Komnenos. He is first mentioned in 1057, the year his elder brother Isaac I Komnenos, at the head of a group of generals, rebelled against Michael VI and forced him off the throne. 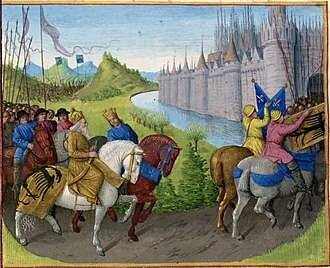 At the time of the revolt, John held the post of doux and his supporters led the opposition against Isaacs stringent economizing policies, forcing him to resign on 22 November 1059, after which he withdrew to the Stoudios Monastery. The crown passed to Constantine X Doukas, although Bryennios asserts that it was first offered to John and he died as a monk on 12 July 1067. John Komnenos married Anna Dalassene, the daughter of Alexios Charon,1028, long outlived her husband and after his death ran the family as its undisputed matriarch. Laonikos Chalkokondyles, Latinized as Laonicus Chalcondyles, was a Byzantine Greek historian from Athens. He is known for his Histories in ten books, which record the last 150 years of the Byzantine Empire, Chalkokondyles was a member of a prominent family of Athens, which was ruled by the Acciaioli. His father George was a kinsman of Maria Melissene, the wife of Duke Antonio I Acciaioli, during his absence, the Duchess was enticed out of the Acropolis and a young scion of the Acciaiuoli family, Nerio II, was proclaimed Duke of Athens. Meanwhile, George Chalkokondyles had his proposal rejected, despite offering the Sultan 30,000 gold pieces, George with Laonikos and the rest of the family relocated to the Peloponnese. The one glimpse we have of Laonikos himself is in the summer of 1447, Cyriacus describes him as a youth egregie latinis atque grecis litteris eruditum. It was at Mistra where Laonikos was taught by George Gemistos Plethon,70.6, written in 1318, with corrections by Plethon, and used by Bessarion in 1436 to make another copy, contains a subscription written by Laonikos. Laonikos movements and actions after 1447 are not known with certainty, internal evidence has led Anthony Kaldellis to put the date Laonikos stopped writing his Histories as 1464. Other speculations about Laonikos Chalkokondyles life are not as widely accepted, after Skanderbeg leaves the Ottoman army and becomes leader of Albania on his own right, Chalkokondyles is brought as a hostage to his court to witness the First Siege of Krujë. After the destruction of Constantinople, Chalkokondyles wrote his most important historical work and this historical work comprises one of the most important sources for the students of the final 150 years of Byzantine history, despite being defective in its chronology. The capture of Constantinople he rightly regarded as an event of far-reaching importance. The work sketches other manners and civilization of England and Germany, for his account of earlier events he was able to obtain information from his father. His model is Thucydides, his language is pure and correct. Sivas is a city in central Turkey and the seat of Sivas Province. According to a 2011 estimate, its population is 425,297. Rail repair shops and a manufacturing industry of rugs, cement. The surrounding region is an area with large deposits of iron ore which are worked at Divriği. 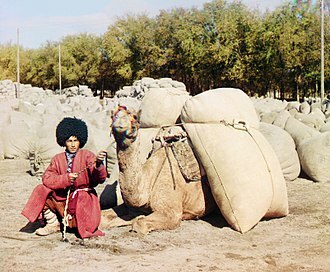 Sivas is a hub for the north-south and east-west trade routes to Iraq and Iran. With the development of railways, the city gained new importance as junction of important rail lines linking the cities of Ankara, Samsun. The city is linked by air to Istanbul, the popular name Sebastian derives from the Latin Sebastianus, meaning someone from the city. Excavations at a known as Topraktepe indicate Hittite settlement in the area as early as 2600 BC. In 64 BC as part of his reorganization of Asia Minor after the Third Mithridatic War, numismatic evidence suggests that Megalopolis changed its name in the last years of the 1st century BC to Sebaste, which is the feminine form of the Greek name corresponding to Augustus. 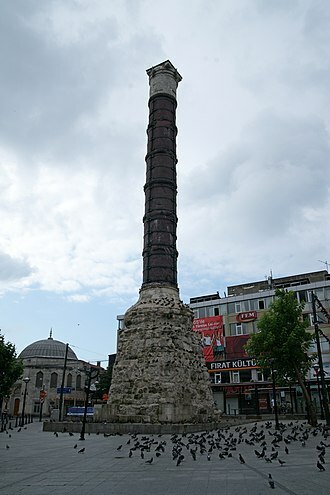 The name Sivas is the Turkish version deriving from the name Sebasteia and it was the place of martyrdom of the Forty Martyrs of Sebaste, 4th century. Justinian I had a wall around it rebuilt in the 6th century. Sebasteia was the first important city to be plundered by Turkish tribes in 1059, in the August of that year the troops of various emirs gathered before the unwalled city. Initially they hesitated to sack it, mistaking that the domes of the several Christian churches were tends of military camps, as soon as they realized that the city was defenceless they burned it for eight days, slaughtered large part of its population and took many prisoners. The city came under the domain of Turkmen Danishmend dynasty after the Battle of Manzikert in 1071, after the death of Danişmend Gazi, Sivas passed to Nizamettin Yağıbasan who won it after a struggle with Danişmend Gazis successors. In 1174, the city was captured by Seljuk ruler Kilij Arslan II, it passed to the Ilkhanids and Kadı Burhanettin. 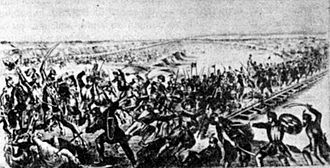 The city was acquired by Ottoman Sultan Bayezid I, in 1398, Tamerlane swept into the area and his forces destroyed the city in 1400, after which it was recaptured by the Ottomans in 1408. Through intermarriages with other noble clans, notably the Doukai and Palaiologoi, the Komnenos name appears among most of the major noble houses of the late Byzantine world. The first known member of the family, Manuel Erotikos Komnenos, acquired estates at Kastamon in Paphlagonia. The family thereby quickly became associated with the powerful and prestigious military aristocracy of Asia Minor, the Romanian historian George Murnu suggested in 1924 that the Komnenoi were of Aromanian descent, but this view too is now rejected. Modern scholars consider the family to have been entirely of Greek origin, Manuel Erotikos Komnenos was the father of Isaac I Komnenos and grandfather, through Isaacs younger brother John Komnenos, of Alexios I Komnenos. Isaac I Komnenos, a Stratopedarch of the East under Michael VI, in 1057 Isaac led a coup against Michael and was proclaimed emperor. Although his reign lasted only till 1059, when his courtiers pressured him to abdicate and become a monk, the dynasty returned to the throne with the accession of Alexios I Komnenos, Isaac Is nephew, in 1081. By this time, descendants of all the dynasties of Byzantium seem to have disappeared from the realm. Thereafter the combined clan often was referred as Komnenodoukai and several individuals used both surnames together, several families descended from the Komnenodoukai, such as Palaiologos, Angelos and Laskaris. Alexios and Irenes youngest daughter Theodora ensured the success of the Angelos family by marrying into it. Under Alexios I and his successors the Empire was fairly prosperous, Alexios moved the imperial palace to the Blachernae section of Constantinople. 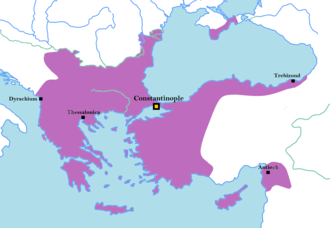 Much of Anatolia was recovered from the Seljuk Turks, who had captured it just prior to Alexios reign, Alexios saw the First Crusade pass through Byzantine territory, leading to the establishment of the Crusader states in the east. Remarkably, Alexios ruled for 37 years, and his son John II ruled for 25, after uncovering a conspiracy against him by his sister, the chronicler Anna Komnene, johns son Manuel ruled for another 37 years. The Komnenos dynasty produced a number of branches, the Angeloi were overthrown during the Fourth Crusade in 1204, by Alexios Doukas, a relative from the Doukas family. Their first emperor, named Alexios I, was the grandson of Emperor Andronikos I and these emperors – the Grand Komnenoi as they were known – ruled in Trebizond for over 250 years, until 1461, when David Komnenos was defeated and executed by the Ottoman sultan Mehmed II. Mehmed himself claimed descent from the Komnenos family via John Tzelepes Komnenos, the Trapezutine branch of the Komnenos dynasty held the name of Axouchos as descendants of John Axouch, a Byzantine nobleman and minister to the Byzantine Komnenian Dynasty. A princess of the Trebizond branch is said to have been the mother of prince Yahya, another branch of the family founded the Despotate of Epirus in 1204, under Michael I Komnenos Doukas, great-grandson of Emperor Alexios I. When the eastern Empire was restored in 1261 at Constantinople, it was ruled by a closely related to the Komnenoi. Gold tetarteron of Michael VI.